1) The above was found in a search of the Historical St. Louis Post Dispatch archives (1874-1922) available at the St. Louis County Library website to those with a library card. This entry doesn't appear when a search is conducted on "Feinstein" even though my second great grandfather's name is fairly legible. I did find it however when searching for "Odelsohn." It's a good reminder that OCR [Optical Character Recognition] search technology isn't perfect, and will miss occurrences. 2) Julius Odelsohn and Selig Feinstein were brothers. As I mentioned on Saturday, both changed their surname from Dudelsack when they arrived in America. 3) Judging from the dollar figure relative to the rest of the entries on the page, this was a valuable piece of land for 1907. 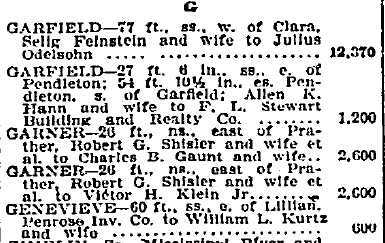 4) According to City Directories, Selig Feinstein had moved to 5600 Garfield in 1906. By the time of the 1910 census he was living at 1941 Burd avenue. However, Selig's son, Harry Feinstein, is listed as renting 5604 Garfield, and Selig's brother, Julius Odelsohn, is listed as owning 5606 Garfield. It's not clear if Harry is renting from his father or uncle, though it's likely one of the two.